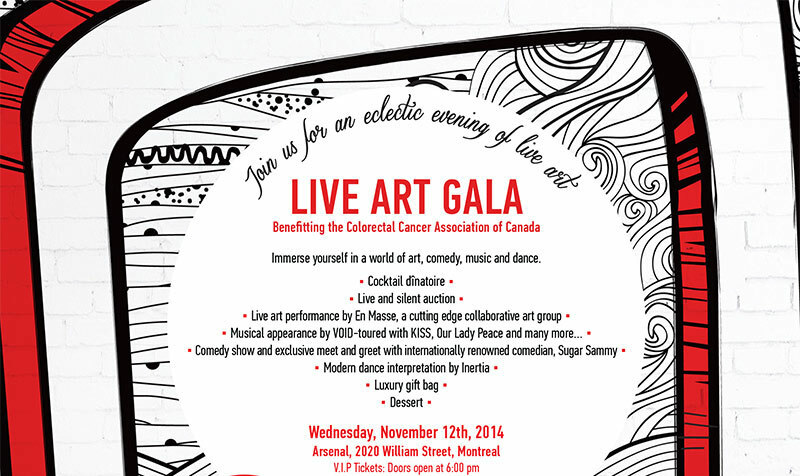 Next Wednesday, Nov 12, Montreal’s vibrant art scene will band together in support of the Colorectal Cancer Association of Canada (CCAC). Presented by Cogir Management Corporation, the Gala event aims to raise funds and bring awareness to the devastating disease as well as to the importance of early, preventative screening. Headlining this year’s event will be none other than Montreal’s very own comedy rock star, Sugar Sammy. The event will also gather musicians like Steve Mastroianni (aka VOID) and singer Corina Vincelli along with a real-time painting event by EN MASSE, the collaborative live art group featured at the Montreal Museum of Art. Also, an appearance will be made by Inertia, a Montreal modern dance troupe. Held at Arsenal on William Street, attendees will also be treated to a cocktail dînatoire and dessert. Colorectal Cancer is the second leading cause of cancer death in Canada and is 90% curable if detected in early stages. This can be beaten and with our collective effort, we can make that happen sooner than later. Come on out and raise some fun (and some funds) for a great cause. For more information and to buy tickets, check out their website!